Phnom Penh, the capital of Cambodia, is located in the center of the country, at the confluence of the Tonle Sap and Mekong rivers, a strategic place chosen after the decline of Angkor as a capital. 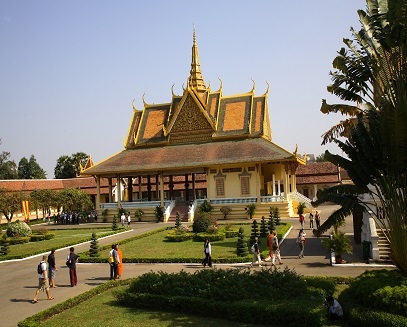 Phnom Penh has survived through the ages and in fact developed throughout all periods that had an impact on Cambodia. During the French protectorate, many colonial buildings were built, such as the National Library, the Central Market, the Royal Palace and the National Museum. During Khmer Rouge period, many buildings were deserted, and others such as the S21 and the Killing Fields were converted into Khmer Rouge quarters. Nowadays the country is experiencing strong economic growth that is changing many aspects of the city, and old colonial buildings are sitting next to new skyscrapers, monks from pagodas are walking in the streets in the middle of the hustle and bustle of the city, and the old headquarters of the Khmer Rouge are open to visitors. Moreover, with over one million inhabitants, Phnom Penh is the best place to discover the local life of city-dwellers. As the city is the economic and political center and of course the capital of the country, international and national flight connections from the International Airport of Phnom Penh make the city easy to reach, as well as the many road connections between Phnom Penh and other cities.